What is Bitcoin? It’s seemingly everywhere. 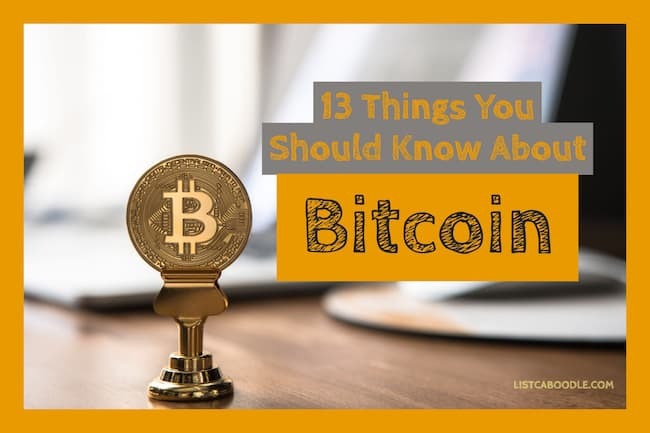 You’ve read the headlines, heard the news, and might even know something about the cryptocurrency called Bitcoin. Let’s shore up that knowledge with 13 questions and answers that will provide you a basic understanding. As always, please don’t take any of the following as investment advice – consult with a reputable financial advisor. Here’s a quick primer to help you understand the Bitcoin phenomenon. You might also want to check out “Banking on Bitcoin” which is a documentary on Netflix. Bitcoin is a digital currency and is independent of any printed currency or coins. It is a decentralized form of currency that is not backed up or controlled by a government or organization. Unlike traditional currency, it is not issued by any institution but has to be ‘mined’ using computer systems. This cryptocurrency has a current market capitalization of over $147 billion, the highest for any such currency in the market. Bitcoin was invented by Satoshi Nakamoto, whose identity has not been established, in the year 2009. The goal behind the cryptocurrency’s creation was to have an electronic cash system that was not controlled by any centralized authority. Bitcoins allow you to make international payments anonymously and without incurring huge costs. Transactions in bitcoin are recorded in a blockchain in a chronological and public manner. By design the blockchain technology is decentralized. Blockchain was developed in 2008 specifically for bitcoin but the concept has spread quickly to other applications. A “block” refers to a record of transactions. Once a block is completed and then added to the chain, it creates a series of blocks, or a blockchain. If you own bitcoin, what you have is a private key – essentially a long password – to its address on the blockchain. With this key, you can withdraw currency or folks can add currency to your account. Importantly, you must keep track of your key. Without it, you can’t access your currency. 2. Bitcoin Value: What is it based on? Bitcoin’s value is based on factors of simple economics such as scarcity, supply and demand, and utility. The cryptocurrency’s maximum numbers are limited to 21 million and this makes scarcity one of the main factors driving its value. However, there is a difference between the price and value of this digital currency. The price of this currency is affected by the market where it trades and depends on supply and demand. So its price gets affected in a way similar to that of gold. Traders can trade the currency on a Bitcoin exchange that sets the price at a specific time in a specific market. Eventually, the price is set by the traders. Blockchain technology enables the transfer of money around the world by bypassing traditional organizations like banks. Check out this list of Bitcoin quotes, sayings and predictions from industry insiders, traders and politicians. 3. How do you buy Bitcoin? In order to purchase this cryptocurrency, it will be required to have a Bitcoin wallet to start with. There are many websites that allow you to download this wallet. The wallet provides you access to an account page that has lots of similarities to your conventional online banking account page. Once you have signed-up for a wallet, you can purchase bitcoins using regular money. You can purchase the currency from a Bitcoin exchange by paying with a credit card, bank transfer or other traditional methods. The number of bitcoins purchased will get transferred to the wallet. At a more technical level, the wallet stores a private key and not the Bitcoin itself. The digital currency is not stored anywhere. If you have bitcoins, the private key works similar to your ATM PIN and should be kept a secret. It is required for authorizing transactions using the currency. It is important to encrypt your wallet using a strong password. You should know about the different potential risks with regard to having a Bitcoin wallet. Vulnerable Bitcoin Wallets: The wallets are vulnerable to hacking attacks. Malware attacks are capable of intercepting communication between wallet and computer systems and divert the funds to different accounts. Cyber Attacks on Bitcoin Exchanges: There have been instances of major attacks on Bitcoin exchanges. In the 2014 Mt. Gox attack, hackers were able to steal 0.85 million bitcoins with value of over $7 billion at the current rate. Distributed Denial of Service (DDoS) is another potential security threat to the cryptocurrency. Double Spending: This is another potential risk that affects the use of Bitcoin. Unethical practices can result in the use of the same coin twice within the same transaction. Since Bitcoin transactions are irreversible and unregulated, there is no recourse if any discrepancy is created. 51% Attacks: Today, miners create communities to make the most of computational power. However, there is a conceptual threat known as the 51% attack, which states that when such a group controls over 50% of the mining power, they could be able to manipulate transactions. 5. What is Bitcoin gold? Bitcoin Gold emerged as an alternate fork to the primary blockchain with the goal of making mining more equitable. Its objective is to allow anyone to start mining for the cryptocurrency using basic hardware – something which was possible during the early years of the currency’s existence. Over time, mining Bitcoin has become a centralized process where large groups and/or companies with powerful computer systems mine most of the Bitcoin. One of the key rules here is to make changes to the algorithm of mining by eliminating the difference in speed of mining between someone using a standard computer system and a group using specialized computer rigs. Ether: This is a cryptocurrency made for a decentralized platform known as Ethereum, which executes peer-to-peer smart contracts. Founded in 2015, it is currently valued at $1.1 billion and it allows users to code and implement contracts without the need for third parties. Litecoin: This cryptocurrency was launched in 2011 and it makes use of elements known as ‘scrypt’ as evidence of work. Similar to the Bitcoin in so many ways, this digital currency has faster block generation rate. It is used in exchange for goods and services and touched the highest overall valuation of $1.2 billion in 2013. Ripple: This cryptocurrency is referred to as a real-time global settlement network that enables affordable and instant international payments. It also stands out for its transparency. Ripple was launched in 2012 and touched a market cap of $1.26 billion. There is no mining process involved, thus reducing the need for computing power. In fact, the digital currency has also found acceptance by certain banks and payment networks as a way to reduce costs. Some of the other well-known cryptocurrencies include Dogecoin and Dash. 7. How to get Bitcoins? A Bitcoin exchange is an online marketplace that allows you to buy and sell the digital currency using traditional currency. This exchange helps buyers and sellers to trade in a similar way as in a conventional stock exchange. A trader can select market order to authorize the exchange to trade their coins for the optimal price. Similarly, traders can also select limit order to trade in the cryptocurrency. The Bitcoin is currently priced at just around $7,000, but it not the highest price that it has touched. At the time of its launch, the cryptocurrency had basically no value at all. In March of 2010, the coin was valued at a meager $0.003. BitcoinMarket.com is the first exchange that allowed trading in the digital currency (the exchange is no longer operational). Bitcoin’s price kept fluctuating over the years until in November 2013 when it crossed the $1,000 mark at Mt. Gox. A recent surge in the coin’s value saw it touching an unprecedented figure of $17,900 in December 2017. Since then its value has stabilized to around $7,000 per coin. 10. What is a Bitcoin Fork? A Bitcoin fork is a set of changes made to the software of the digital currency for creating a different version of the blockchain. There are many reasons why it may be created. Whenever a change is proposed to this cryptocurrency’s protocol, it is important that a significant percentage of the users show their support. Once such an approval is received, it results in the creation of a new fork. 11. How to mine Bitcoins? There are two different ways in which you can mine bitcoins. Purchase the Hardware: Choose a powerful ASIC-enabled miner that is highly energy efficient to keep the cost of operation low. Join a Mining Pool: You can decide to mine the currency yourself or by joining a pool, which is a group of miners. When you join a group, you are able to earn more regular rewards. However, when you mine alone, the rewards may not be as regular and it can take a long time to earn even a single Bitcoin. When you join a pool, it is required to pay a certain percentage of your earnings as a fee. Install a Mining Software: Once you have decided whether you want to work alone or join a mining pool, you should install a mining software and link it to your hardware. Also, check out this video on Bitcoin Mining? The second way to mine the digital currency is to consider cloud mining. This is different from personal mining in that you are renting the mining hardware from a reputed company. Mining companies provide different mining packages that vary in terms of hashing power. A higher package can help generate profits faster. Once you have chosen a mining company, you can then join a mining pool. The larger a mining pool, the better are the chances of earning bitcoins. It is recommended to become part of a reputed and proven team to get the highest-possible returns. Once you start earning the cryptocurrency, it is suggested to transfer it into your secure wallet. Impersonating as Bitcoin Recipients: Hackers can impersonate as companies, which launch Initial Coin Offerings asking for Bitcoin funding, by creating similar but fake websites. These hackers then persuade interested investors to transfer the cryptocurrency into their Bitcoin wallets. Since the digital currency cannot be recovered through any method, the investors simply lose the coins to the hackers. Exit Scams: You should also be careful when choosing to invest through a Bitcoin exchange or market. While you maintain an account with them in the cryptocurrency, such companies can vanish after claims of having been hacked. This act has been named as exit scam. AntPool: The company behind AntPool is Bitmain and it has been in existence since 2013. The company has an overall hash rate of 17.82%. F2Pool: This Chinese Bitcoin mining pool is different in that it doesn’t own any hardware, but relies solely on the hardware owned by its member users. It is also referred to as DiscusFish and has a 16.49% hash rate. BitFury: This Bitcoin mining company has received widespread recognition because it raised tens of millions of dollars in funding since its inception. Its hash rate percentage stands at 16.4%, just behind F2Pool. BTC China Pool: This company was launched in 2014 and has a 13.74% hash rate. It is a relatively new company but it is among the biggest players in this market. There are many other players in the Bitcoin mining sector that continue to grow at a fast pace. Back in 2014, when the Bitcoin was trading at just around $1,000, a few enthusiasts and investors claimed that it would soon touch the $40,000 mark. It was a time when the world was just beginning to realize the potential of this cryptocurrency. The coin may not have touched the magical figure, but even at $17,900, it was a groundbreaking feat. There are no assurances about the future of this digital currency. However, with a cap on the total numbers at 21 million, Bitcoin may become scarce – and scarcity is a big factor in driving sky-high prices. It remains to be seen. Regulation could thwart prices and the spirit of this rebel currency.